Homeowners witnessed a steady rise in U.S. interest rates from 1 to 5.45 percent in 2004. Owners of subprime mortgages began defaulting. By 2006, defaults on subprime mortgages rose to record levels. 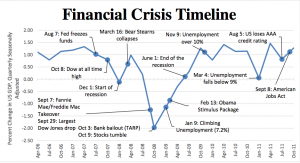 Even though evidence of the impending crisis emerged years earlier, most Americans did not recognize the United States had a financial problem until 2007 according to Dennis McCuistion, task force leader of the NCPA’s Financial Crisis Initiative. Two major subprime lenders filed for Chapter 11 bankruptcy in 2007. Freddie Mac announced it would no longer buy risky subprime mortgages or mortgage-related securities. In July it was reported that as much as $100 billion in losses could occur on subprime loans attached to national lenders. – Goldman Sachs earned $4 billion in 2007 by betting securities backed by risky home loans would fall in value. The firm admitted to providing investment ideas that it had already traded on, sometimes betting against the investments it recommended to clients. – The Census Bureau announced new home sales in November 2007 were down 34 percent from November 2006. This was the largest decline since 1991 during a previous recession. – In March 2008, Bear Stearns reached the brink of bankruptcy and the Federal Reserve lent it money. On September 15, 2008, Lehman Brothers filed the largest bankruptcy in U.S. history. The U.S. government took over American International Group the next day. AIG had guaranteed hundreds of billions of financial instruments issued by Lehman. The Treasury Department feared AIG’s failure to meet its obligations would create a global financial meltdown and provided an $85 billion loan. By September 18 2008, Paulson requested Congress approve the purchase of distressed assets from financial companies. In October, Congress approved the $700 billion bailout plan. Many questioned the constitutionality of such a move.